By Chris Sullivan, Vice President of Sales and Marketing for ChemSystems Inc. There are four ways to cover concrete. Each of these provides a distinct look, with benefits and differences we will examine. For even more information, read types of overlays. Have you ever considered concrete or a concrete topping as a floor covering? For the most part floor coverings have always referred to carpet, tile, hardwood or some other surface commonly used to cover concrete sub floor materials. 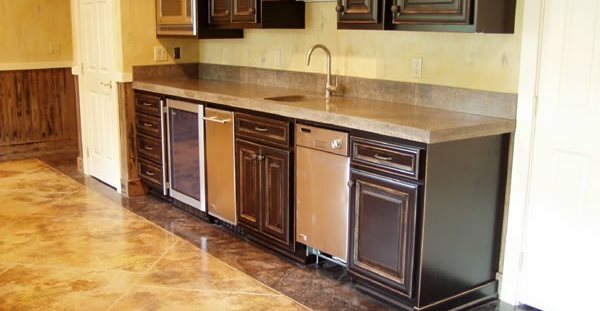 With the growth of interior decorative concrete finishes, we can now add concrete to the list of options of floor coverings for your next interior floor project. While most concrete floor coverings can be used both interior and exterior, for simplicity we will focus on interior flooring, especially since this is where a vast majority of these materials end up being used. While the history of decorative overlay or "concrete floor covering" industry is relatively short, less than 20 years, these materials were all developed from the concrete underlayment industry, which has been around for 50 + years. About 20 years ago, polymer technology had developed to a point where cement-based products could be modified enough where they could be placed ultra thin (less than ¼ inch thick) while still maintaining their integrity, durability and strength. In recent years the technology has evolved to the point where certain decorative overlay materials can be applied the thickness of a credit card while still achieving in excess of 6000 psi point compression strength. When you consider how thick a credit card is, that makes these materials all that more impressive. Also known as stampable overlays, are designed for one purpose, and one purpose only - to provide a textured surface similar to stone, tile, brick, wood, or other natural material. These stampable overlay systems typically range in thickness from ¼ inch to 5/8 inch. The common thickness is 3/8 inch, which is usually thick enough to accommodate most standard imprinting tools in the market place. Stampable overlay systems are designed to be applied with a gauge rake, quick trowel smoothed, and then imprinted with the desired texture or stamp tool. Either a powder or liquid release material can be used, depending on the final look and/or color scheme that is desired. These materials cure in 24 hours, and can usually be sealed and light traffic allowed within 36 hours after application. The single most important factor with any stampable overlay application is surface preparation. The surface needs to have sufficient profile (be rough enough) so that the overlay material can bond both chemically and mechanically. I always recommend a mechanical grinding or profiling of the floor, as this will always provide better profile versus an acid etch or other means of chemical surface profiling. If you are looking for a 3-dimensional textured floor covering that resembles most any natural material (stone, tile, wood, etc.) consider a stampable overlay on your next project. Are thinner versions of their cousins the stampable overlay. They utilize "beefed up" polymers that allow the material to go down very thin and yet maintain strength, durability and abrasion resistance. They range in thickness from 1/32 inch up to 1/8 inch thick. They are easily applied with trowels, squeegees, brushes, and or rollers, all depending on the final look that is desired. Most microtopping systems offer a base coat, which contains sand, and is used in the first two applications. Some systems offer a finish coat, which contains no sand, and is used only when an ultra smooth top or final surface is specified. Because these materials are so thin and dry very quickly, texture is limited to how the products are applied. Some typical finishes for Microtopping floor coverings include, but are not limited to smooth trowel, rough trowel, stippled, and orange peel. Like stampable overlays, these systems cure in 24 hours, and are usually ready for foot traffic within 36 hours of application. Another common microtopping finish involves coming back 24 hours after application and applying concrete stains or dyes to create a stained concrete appearance. This is a very popular finish for residential and small commercial spaces. It is important to seal microtopping finishes, as they are micro porous and will tend to collect dirt that is difficult to remove once embedded into the material. Check with the manufacturer of the microtopping system you are using as to what sealers (water or solvent or both) are best suited for that particular application. Floor coverings are not as popular for interior finishes or coverings, but have been around for decades for exterior coverings for pool decks, and patios. In recent years we have seen these types of finishes become more popular in high traffic interior spaces because of their durability, low cost, ease of application, and range of patterns and colors. They are very similar to Microtopping type finishes in that they are thin, but differ in that they usually contain more sand, and provide a rougher, grittier finish. These types of materials are usually applied through a hopper gun under pressure. A fist scratch or "grout coat" is applied. Once the first coat is dry, adhesive backed stencils are laid out over the floor. A second color or wear coat is spray applied over the stencil, and once dry the stencil is peeled up and discarded. The type of finish (knock down, orange peel, smooth) all depends on the spray pattern and method of spray application. Either a clear or colored sealer is then applied for maintenance and aesthetics. 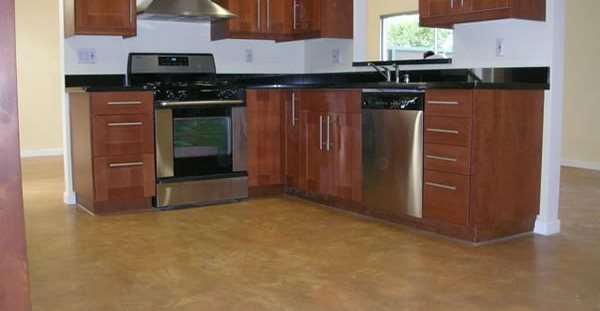 Underlayments used as concrete flooring is the newest trend in concrete floor coverings. Self-leveling concrete has been a staple for repair and leveling of damaged or worn concrete. Until recently, another solid surface floor covering would be placed on top of the self-leveling material. 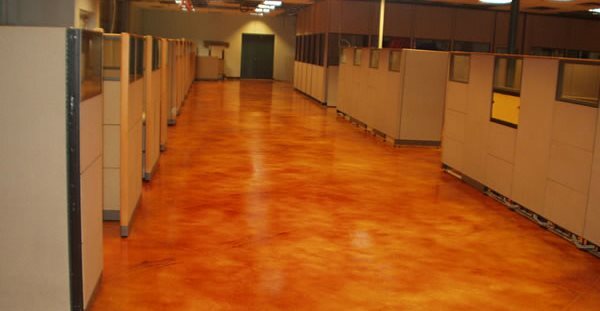 In the last few years contractors have started adding integral color to self-leveling systems, or coming back after 24 hours and using stains, dyes or tints to create colorful floors. 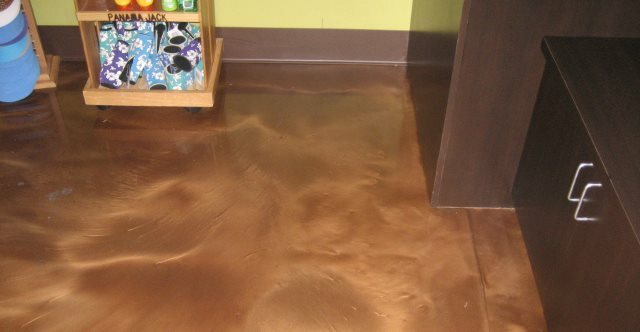 The advantage of a self-leveling system is that it can correct uneven floors, repair damaged floors, and at the same time provide a very dense smooth and durable concrete floor. Self-leveling concrete can be expensive, and does require a higher level of proficiency than the microtopping and spray texture products. Surface preparation, once again, becomes very critical with self-leveling systems. Most self-levelers can go down 1/4 inch to 1 inch, with the ability to go to a feather edge. If you currently have a structurally sound and stable floor, and are considering a new floor covering, don't skip over concrete as a floor covering option. As you have just read, concrete is now available in most any color, with an endless variety of textures and patterns to choose from. These systems are thin, and strong, giving the durability and value of concrete, with the perception of stone, tile, wood, or other natural material. In many cases a little creativity goes a long way in creating a floor covering that is a one of kind, and in many cases much less expensive than its natural material counterpart. The next time you are looking at floor coverings, consider a concrete floor covering.